Mabel Normand was the most accomplished comedienne of the silent screen, and this charming film is the best evidence we have of her work in features. A mixture of tender romance and knockabout comedy, Mabel plays a small town girl lured to Hollywood by dreams of stardom who gets no further than a job in the wardrobe. 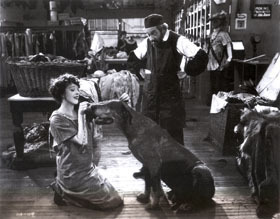 The studio setting gives ample opportunity for her talents to shine, including a classic scene when a lion is let loose.